Editor's note: All videos in this interview are taken from the Japanese version of the game. The final version is fully localised in English. Today, I’d like to ask about The Legend of Zelda: The Wind Waker HD. Before we discuss the Wii U version, I would also like to ask about the original, The Legend of Zelda: The Wind Waker1 for Nintendo GameCube. First, please introduce yourselves, including what you worked on before as well as this time. 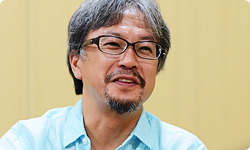 Aonuma-san, we’ll start with you.1. The Legend of Zelda: The Wind Waker: Released for the Nintendo GameCube console in May 2003. I worked as director on the original game. This time as the producer, I went to work hoping to take this opportunity to fix what hadn’t gone well before. I remember saying the same thing for The Legend of Zelda: Ocarina of Time 3D2! (laughs)2. The Legend of Zelda: Ocarina of Time 3D: Released for the Nintendo 3DS system in June 2011. This game is a remake of The Legend of Zelda: Ocarina of Time, released for the Nintendo 64 system in December 1998. It added new elements such as stereoscopic 3D. Right! (laughs) Iwamoto-san? You also discussed The Legend of Zelda: Skyward Sword3 with me.3. The Legend of Zelda: Skyward Sword: Released for the Wii console in November 2011. The game’s setting revolved around an island floating in the sky called Skyloft. The graphics used cel-shaded animation, realistic body proportions, and looked like a painting. The Wii Remote Plus controller made possible a wide variety of intuitive controls. I wasn’t part of the team for the original game. Soon after, I worked on The Legend of Zelda: Four Swords Adventures4 and The Legend of Zelda: Phantom Hourglass5. This time, I was the director.4. The Legend of Zelda: Four Swords Adventures: Released for the Nintendo GameCube console in January 2005. The game had two modes: Hyrulean Adventures and Shadow Battle. Single-player gameplay was possible, but a multiplayer mode achieved by connecting Game Boy Advance systems was an important way to enjoy the game.5. The Legend of Zelda: Phantom Hourglass: Released for the Nintendo DS system in October 2007. Controls using the stylus were a key feature of the game. 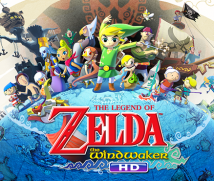 The story takes place a few months after The Legend of Zelda: The Wind Waker. You weren’t involved with the original version of The Legend of Zelda: The Wind Waker, but you have been deeply involved with “Toon Link”6.6. Toon Link: Refers to the version of Link drawn in a distinctive cartoon or “toon” style. Toon Link first appeared in The Legend of Zelda: The Wind Waker, and has subsequently appeared in several The Legend of Zelda titles, as well as Super Smash Bros. Brawl on Wii. Yes. Toon Link and I go way back. This was my first time as a developer for The Wind Waker, so I played through the original again and worked on the places that I thought could be improved upon. For the original version, I had the title of design manager, but to be specific, as a member of the core design staff, I was involved from the start where we talked about things like “Let’s give it this kind of look.” I was also mainly in charge of enemy characters and effects. This time, um…what was I? HD refining art director? In any case, I thought about how to refine all the graphics to HD, while doing a lot of the actual work. In other words, you were the visual director. All right, Dohta-san? The original came out before I joined the company, so I simply enjoyed playing the game. Oh, you were a player! Yes. I played it like other players play. 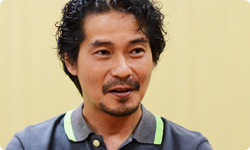 This time, I was paired with Takizawa-san and had the title of HD refining program director. 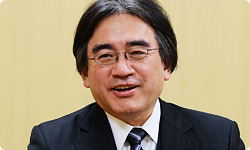 I provided refining direction with regard to the technological aspects of transferring the original Nintendo GameCube visuals to the Wii U version. I participated on the original as a designer trying to see how we could fully create a world based on the character art by Takizawa-san and (Yoshiki) Haruhana-san7. When it came to the refining work this time, I took on the responsibility of taking data from the original and somehow making it work! (laughs)7. 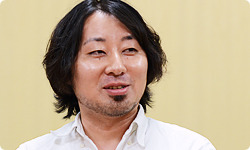 Yoshiki Haruhana: Software Development Department, Entertainment Analysis & Development Division. 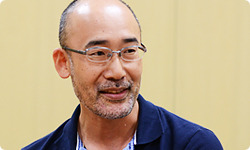 Together with Satoru Takizawa, he was design manager of The Legend of Zelda: The Wind Waker for the Nintendo GameCube console. 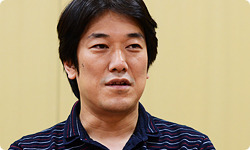 He participated in the session of “Iwata Asks” with the original development staff (Part 2) for The Legend of Zelda: Ocarina of Time 3D. It was your job to make it work. Yeah, it was. Takizawa-san and I checked the data from the original and started pulling it together. Well now, let’s move on. The original version of The Legend of Zelda: The Wind Waker was released in 2002 (in Japan), but at NINTENDO SPACE WORLD8 the year before, in 2001, we had already revealed what this upcoming Zelda game would look like.8. NINTENDO SPACE WORLD: A video game trade show in Japan that Nintendo used to hold. That announcement was shocking to Zelda fans. Many were surprised and puzzled. How did those visuals come about and how did you create that world? In other words, could I ask you to first talk about how Toon Link came to be? Well… that look wasn’t what I had at first proposed. At the time, Haruhana-san and I were a part of the core staff from the start, and we had been trying to figure out which graphical direction to take for the next Zelda game. And we wondered whether continuing the path taken by Ocarina of Time, and evolving upon it by giving it more detail was really the right path. You were looking for a direction to take on how to evolve the series. Of course, simply carrying on down that road was an option, and we proceeded with a prototype, but it was incredibly normal and didn’t exceed expectations. The looks improved, as expected. At NINTENDO SPACE WORLD the year before, in 2000 when we announced Nintendo GameCube, we showed a demo video of an evolved form of Link from The Legend of Zelda: Ocarina of Time, so a lot of people were expecting something along those lines. Yes. But it was difficult for us to imagine ourselves easily coming up with new ideas and expanding on that world if we had chosen that path. Of course, while a game is more than its visuals, it was going to be made mostly by the same people, and the ideas we had within the same team has its limits. Everyone on the core staff making the game at that time had a sense that proceeding in that direction didn’t feel quite right. Then one day, out of the blue, Haruhana-san hit us with that new Link . Just out of the blue? Soon after you saw that, you drew a picture of a moblin 9. 9. Moblin: Man-beast monsters that appear in The Legend of Zelda series. Various species exist, with some able to skilfully use weapons and armor. Haruhana-san’s sketch was a detonator for the core staff that set off a lot of ideas. Looking back at the history of Zelda games, that happens a lot. For Ocarina of Time as well, once we had Link and a certain kind of enemy, gameplay started developing rapidly. Making the action structure and the interaction elements become the starting point for everything else. Once those things are done things rapidly starts branching out. In the case of The Wind Waker, the visuals for Link and the Moblins started everything. Things quickly shaped up around how we would have them fight. Another benefit of those visuals was how we could represent the mechanisms and objects10 for puzzles in a more easy-to-understand way. When the visuals are photo-realistic, it had the adverse effect of making information difficult to represent game-wise.10. Object: Things placed inside a video game space. Here, the term refers to things and landforms involved in the mechanisms for solving puzzles. In terms of the graphics required within a game, sometimes more problems arise the more photo-realistic it is. Exactly. You can’t tell what moves and what you should touch. But if you change the visual style of parts that move, it’ll stick out like a sore thumb. We solved those problems with regard to gameplay, and more than anything, we felt we achieved a new sense of combat against new enemies thanks to the stylised actions performed by cel-shaded11 characters. We decided rather early on that we definitely wanted to go with that direction.11. Cel-shaded: A type of 3D computer graphics imagery that renders 3D data to appear like a cartoon or an illustration.